Whilst it is ideal if you do Blooming Monday on Blue Monday, 16th January, if this date doesn't work for you just pick another date near then. Blooming Monday, on 16th January. Mental Health Research UK thanks everyone who joined in with its annual awareness campaign on 19th January 2015 by wearing bright clothes. We hope the splash of colour got people talking about mental health issues. Thanks also to those who donated to the campaign. The funds will go towards depression research. We hope you will brighten up again in 2016! Mental Health Research UK is run by Trustees who provide their time entirely voluntarily because they feel strongly about the need to make a long-term difference. We have no funds for campaigns and no paid PR assistance. We always welcome volunteers; please email us at trustees@mhruk.org if you would like to help with the campaign. Thank you. We also have some Blooming Monday merchandise you can buy, whilst donating a percentage to MHRUK at the same time. Everyone smiled at work today. but the lady 2nd from the left wins a t-shirt too! Thanks to everyone who joined in Blooming Monday this year. We hope you'll join us next year to raise awareness of depression and seasonal affective disorder. It was great to see the whole team at my work embrace Blooming Monday. 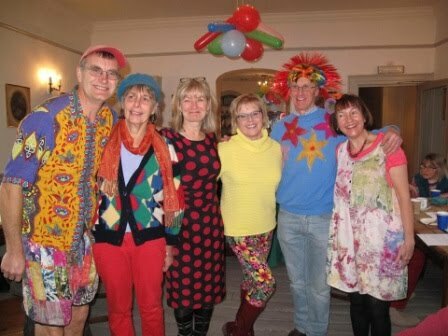 The bright clothes helped cheer that third Monday in January - allegedly the most depressing day of the year. Of course bright clothes won't prevent depression or seasonal affective disorder (SAD), but there is lots of research linking mood and colour. Some mistakenly think drab colours equals professionalism. It's surely time for a culture change - bring on the bright cheery colours! As someone who has in the past been affected by SAD, I can really recognise the benefits of colour - and of course sunlight. Thanks to MHRUK for a great idea and helping us raise awareness and lift that January drabness with a kaleidoscope of colour. The Second Step team took to the airwaves on BBC Radio Bristol on Monday morning 21st January 2014 to talk about combating depression and suicide – dressed in their brightest and best.